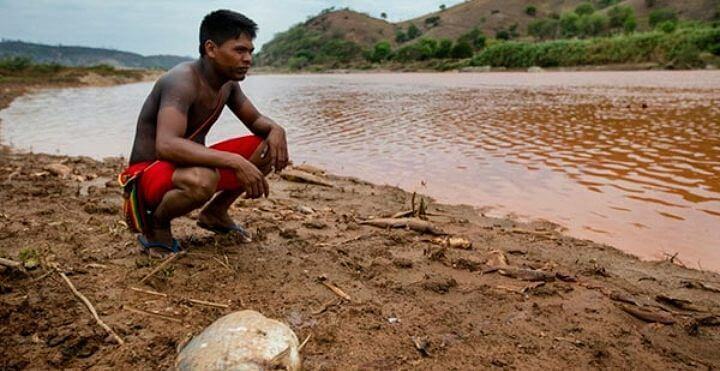 What would initially appear to be the end of the line for the culture and survival of the Krenak indigenous people, impacted by the pollution of the Rio Doce, from the Mariana tragedy, in southeastern Brazil [state of Minas Gerais], could rekindle a 25 year struggle. After being left unable to live without the water of the river, the Krenak population is mobilized around a possible solution for the continuity of the community: to expand the demarcated area of the indigenous territory in the region and to migrate to a new location. In an interview with Adital, Eduardo Cerqueira, member of the Indigenist Missionary Council (CIMI), Eastern Regional office, which comprises the states of Minas Gerais, Espírito Santo and the extreme south of Bahia, affirms that, as a way to resist the tragedy, the Krenak community [is calling] on the federal government to expand the demarcated area into 12,000 adjacent hectares, embracing the region where the State Park of Sete Salões, one of the Units of Conservation of nature belonging to the Government of Minas Gerais, is currently located. “We find the strategy interesting, given that the existing area no longer provides conditions for survival. Something must be done”, attests Cerqueira. At present, the demarcated area of Krenak territory covers 4700 hectares. In this zone, extending more than three kilometers along the Doce River have been impacted and rendered unfit for drinking, fishing, bathing and irrigating vegetation in the vicinity, in the municipality of Resplendor, where 126 Krenak families live. The State Park Parque de Sete Salões was created in 1998, and includes the municipalities of Conselheiro Pena, Itueta and Santa Rita do Itueto, corresponding to one of the largest remnants of Atlantic Forest in eastern Minas Gerais, with mountains, forests and waterfalls. Besides this, the area demanded has potential for indigenous community tourism, receiving visitors and marketing crafts, without damage to the environment. The territory of the Krenak population, in Minas Gerais, was demarcated in the 1990s, but the entire length of the park was excluded, which today could once again be placed on the agenda. In the early 2000s, the Indigenous people filed a claim with the National Indian Foundation (Funai) and the federal government conducted a technical study on the matter, which to date has not been published. In the opinion of the Krenak, now, the situation is more than appropriate to fulfill the historical demand of the population. “Various indigenous leaders are concerned about the territorial question. Now, it is a matter of necessity for this concern to be the focus of discussion. (…) This part of the region was not affected by the tailings [pollution],” defends the indigenous advocate. According to the CIMI counselor, since the socioenvironmental tragedy, the indigenous peoples affected have been assisted with emergency support, by means of tank trucks supplying water, transfer of basic food baskets and financial support for the families, which would ensure the community’s survival only in the short term. “This tragedy was intensified by a period of severe drought. For over a year there has been no rain in the region. Because of this, the tributaries of the Rio Doce are dry. (…) The terrain is not favorable to agriculture. Livestock would be the most common form of indigenous survival, but it is not possible, without water,” explains Cerqueira. Geovani Krenak laments the death of the Rio Doce: “we are one, people and nature, only one,” he says. Photo: Reproduction. A torrent of mud composed of mining tailings (residual waste, impurities and [chemical] material used for flushing out minerals) has been flooding the 800 kilometer length of the Rio Doce since November 5, after the rupture of the Fundão dam, of the Samarco mining company. This is controlled by Vale, responsible for innumerable and grave socioenvironmental damages in Brazil, and the multinational Anglo-Australian BHP Billiton, two of the largest mining companies in the world. In addition to burying an entire district, impacting several others and polluting the Rio Doce, extending through the states of Minas Gerais, Espírito Santo and Bahia, the mud reached the sea over the weekend, even further amplifying the environmental damage, which could take more than two decades before signs of recovery even begin to present. In addition to the destruction of fauna and flora, seven deaths and 17 disappearances have so far been recorded. Early last week, representatives of the Krenak indigenous people, whose tribe is situated on the banks of the Rio Doce, interrupted, in protest, the Vitória-Minas Railroad. Without water for more than a week, they said they would leave only when those responsible for the tragedy talk with them. “They destroyed our lives, they razed our culture and ignore us. This we do not accept,” asserted Aiah Krenak to the press. Considered sacred, in a culture whose cosmological worldview is based on the interconnection between all beings – humans, plants, animals, etc., the river that flows through the tribe was utilized by 350 Indians, for consumption, bathing and cleansing. “With the people, this is not separate from us, the river, trees, the creatures. We are one, people and nature, only one”, says Geovani Krenak. Krenak people protest on the Vitória-Minas Railroad. Photo: Reproduction. Seated along the tracks, under a 41C. degree sun, Indians chanted music in gratitude to the river, in the Krenak language. “The river is beautiful. Thank you, God, for the river that feeds and bathes us. “The river is beautiful. Thank you, God, for our river, the river of all of us,” the words of shaman Ernani Krenak, 105 years of age, translated for the press. His sister, Dekanira Krenak, 65 years old, is attentive to the impact of the death of the river affecting not only the indigenous peoples, being a source of resources for many communities. “It is not ‘us alone’, the whites who live on the riverbank are also in great need of this water, they coexist with this water, many fishermen [feed their] family with the fishes,” she points out. Camped on site in tarpaulin shacks and sleeping mats in the open air, the Indians, now, must also face an unbearable swarm of insects. “It was never like this,” says Geovani Krenak. “These mosquitoes came with the polluted water, with fish that once fed us and that are now descending the river, dead, he reports. Article originally published in Portuguese at Adital. Translated to English for Intercontinental Cry by M.A. Kidd. Republished with permission of Intercontinental Cry.